With Halloween looming, would anyone like to do a small zombie swap? Not necessarily tiny in dimension, but just a 1 point swap, something small that could be knocked out in a weekend? If we had a quick turn around, we could probably get our items before Halloween. And if not, is there ever really a bad time for a zombie? A few of you were interesting in getting a tute, so I made one! So I do almost all fabric prep sitting on the floor, it's where I have the most room. Whatever your style is, first shake out the shirt so that it's flat, and put it collar towards you. Lay down your full front pattern, careful to keep the exact centre down the centre of the shirt. My pattern piece has a permanent crease in the centre, maybe mark yours with a marker? Get your pattern neck as close to the crew neck collar WITHOUT including any of the crew neck, or if you have to, just the tiniest bit, less than your 5/8th seam will be. Once that's pinned, fold in the side of your pattern so that it stops BEFORE the seam attaching the sleeve to the shirt. You'll be able to feel where that is without lifting up your pattern. If it's a shirt brand that has side seams, also make sure it's folded before that seam. It's okay if it's diagonal. The larger a body you have, the more a flat diagonal line is straight on a 3d body. Once you do one side, measure and do the exact same to the other side. I generally measure at the point of the hem, and the point of the arm/side seam. This is when you find out if you've centred your pattern properly, because the other side should also not be touching seams. If you haven't, unpin and try again. It's annoying, but worth the effort to be symmetrical. Cut it out! You'll have pinned through both layers of the shirt, everything gets skewed if you try to lift things to only pin through one layer. However, it's super important you only cut through the top layer. I suggest tiny cuts and checking every few inches. Eyeballing it, cut up the centre. Without measuring anything, sew each half to the front, making sure of course to have good sides together. Once it's sewn together, press the seams open. Fold your shirt in half again, matching the points of the top of the collar and the wing seams. Lay down your 'place on fold' original pattern piece and cut it out. Now that you have a completed front piece of your shirt, sew the rest of it as normal. Try it on, and compliment yourself! Note: this way only works when you're only upsizing a few sizes. 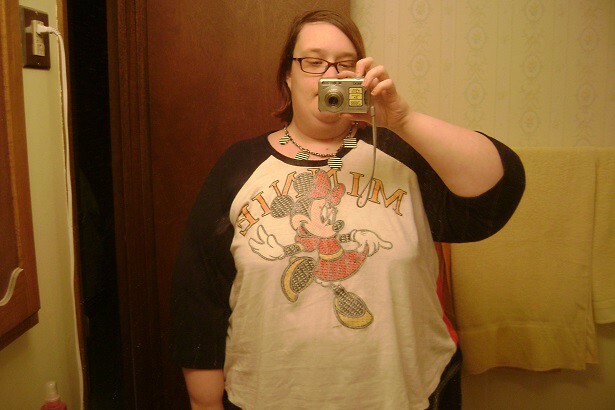 My original shirt was a 1xl, and I'm about a 3/4xl. If you're trying to go further, like my Fringe Festival shirt from my previous post, there won't be enough fabric in the back to get the wings done. In that case, sew multiple stripes of fabric for the wings. I hope this is all clear enough. Feel totally free to ask if you have any more questions! I have a lot of shirts that don't quite fit, that were bought for souveniers, or given to me as presents. They mean too much to donate, but I can't actually wear them. So I decided to figure out how to make my perfectly drafted raglan shirt pattern work with them. Attempt One: I decided to go easy on myself for my first try. I used an old shirt of my mom's, something I'd be happy to wear if it worked, but not upset if I wrecked it. I had a hell of a time folding the shirt exactly in half to fit the pattern. You can't really see it in the pic, but I used red fabric for the back. 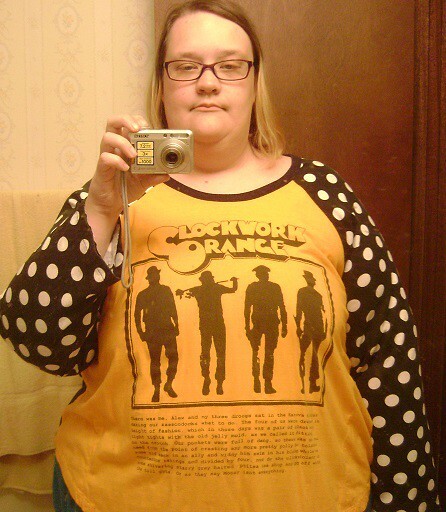 Attempt Two: I love Clockwork Orange, I have a large collection of artwork of it. When I was in London a few years ago, first at a convention and then with a close fandom friend's house, we wound up at Camden Market, and I saw a CO shirt. I had to get it, even though it was only a 1xl. 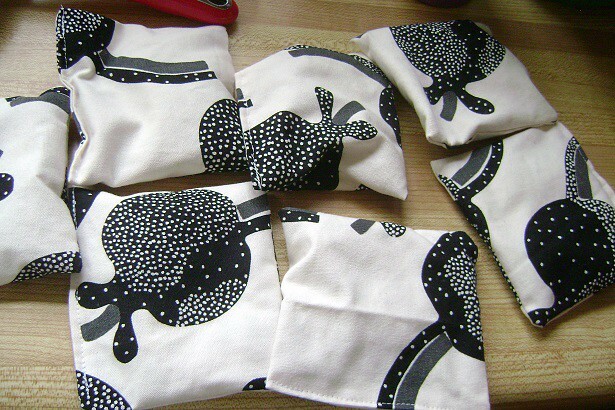 For this one, to make life easier I made pattern pieces that were full sized instead of 'place on fold'. I used the back of the shirt to add stripes to the front, for width. The seams aren't very noticeable. 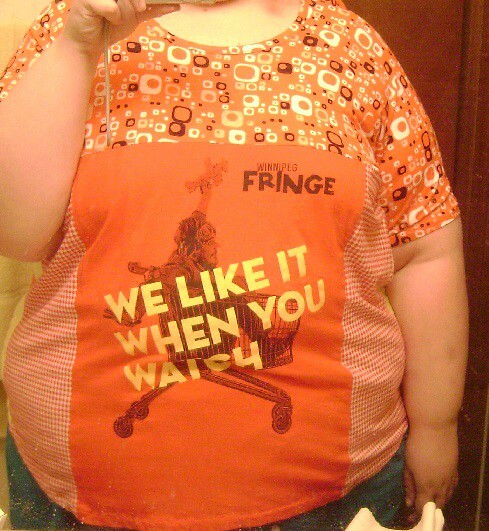 Attempt Three: The Fringe Festival is the most important event of my year. Well, that and Christmas. Every year they make a new shirt based on the year's advertising theme, but I've never bought one before, figuring that if I buy one, I'll want to buy one every year, and that's not feasible. But in 2017 they were selling all previous years left over stock for 5 bucks, and they happened to have one of my favourite campaign, the "we like to watch" campaign. I figure it's applicable to any year I attend from now til the day I die. Thing is, the only size they had left was small. Not only was it MUCH too small widthwise, it was also too short for my pattern. So for this one I made many patchwork pieces. 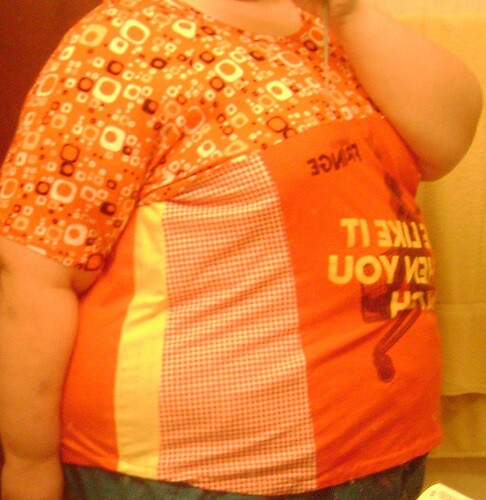 I'm definitely going to keep on reconning, I have at least five or six more shirts that are too small. I started working at a new daycare about a month ago, and I noticed they didn't have a lot of throwing equipment. So I made some bean bags. I made a cotton square, filled it with corn kernels, then made a canvas square to jam the cotton square into. I'm hoping that with the double layers, they'll last a little longer. I've semi-recently started getting into making embroidery hoops for swaps. Nothing too complicated yet, I pretty much only know one stitch, but I like how things have turned out so far. In the recent Astrology swap, I made my partner a Sagittarius shirt. I printed off the design, then cut it into recycled plastic, and then stencilled it a dozen times. I think it came out quite nice.